Cats have provided writers and artists with inspiration for as long as they have been winding themselves purring round their owners’ legs and fixing them with their big, green eyes. 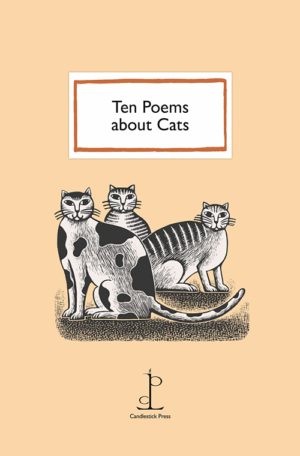 The poems in this pamphlet are evidence of some wonderful cats and their amusing and endearing ways, from Thom Gunn’s kittens galloping like a re-enactment of Ben Hur along the corridor, to Jen Hadfield’s cat asking to be let in at the kitchen door…then out again… . It goes without saying that this pamphlet is best enjoyed with a cat on your lap. Poems by Elizabeth Coatsworth, William Cowper, Thom Gunn, Jen Hadfield, Walter de la Mare, Grace Nichols, Anne Stevenson, Anna Wigley.